I get a 1/16” gap from left to right at either end of level. From top to bottom I get 1/8” gap at either end of my 24” level. Is this bowing ok? I get very little bow at the short ends of my tank. I drained half the water and found the bow very similar than when the tank is full. I was planning on running an old Tunze wave box on the tank as part of a stress test to test the seams. Tank panels were laser cut and all lasered edges were shaved off till stress bowing of the panels were relieved. 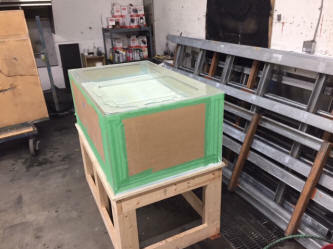 One of the well known tank manufacturer wanted to make this tank out of 100% 1/2” acrylic. I totally didn’t want that!!! I am having some trouble with a 20 gallon aquarium rack that I built and I am looking for some advice. when it comes to woodworking and I did not do that great of a job. I tried my best using a carpenter's square and a miter square to get everything squared up as I was building it, but I seem to have failed that. The rack came together fine but when I bought it in the house to test out to see if it was level or not, it rocked. I checked the floor with a level and it was level. The rack is actually going in the garage so I was planning on putting some leveling feet on it, which I did. I was able to get it level to the garage floor, which is slightly sloped for drainage reasons. Anyways, after I leveled it, I put an empty 20 gallon tank on the top of the rack and it rocked. It seems that the back left corner and the front right corner are too high. As you can see from the attached picture, the gap created is quite large! I checked the middle and bottom and both of these have the same problem as the top. I was scratching my head trying to figure out what I could do to fix this, so I went and got some plywood cut to fit the rack to turn it into a shelf. After adding the plywood, the tank still rocks! Why is this? I am unsure what to do at this point. I see a lot of people using some type of foam under the tank to help with minor issues, but I feel like the gap is too big for this. Is my best bet going to be to take down the corners with either sandpaper, a wood chisel, or a plane? I am worried that if I attempt this, I am going to end up taking too much wood off and end up needing to rebuild the whole rack, which I really don't want to do. I think I did a decent job for my first attempt at building such a rack, but obviously not good enough! and how much unevenness will 1/4 Styrofoam compensate for. "It was the best of times, it was the worst of times." Sorry to get all "literary" with you, but it seemed to describe accurately my dilemma. It was the best of times in that, finally, after four and a half years without a fish tank, I am ready to get wet again. The stand was built, the plumbing and sump were worked out in the basement, and this past Saturday a friend and I moved the stand and tank into the den. I worked for a couple of evenings on and off getting it perfectly level. I even learned a couple of neat tricks that I will share below. The tank is now level and ready to be filled beyond the 2 3/4" that I have already put in it to level it. It was the worst of times in that last evening, while I was finishing up the leveling, I noticed a chip in the front left corner of the tank (see picture). This tank is a 75 gallon with the overflow offset in the middle of the left half of the rear of the tank (I think it's an AGA). I got it slightly used four years ago, and it has been sitting in my basement since then. I've had it filled several times--right after I bought it, to check the stand, and to check the plumbing/sump. Each time it was filled for several days (once for a week). The last two fillings were recent (the plumbing check was last month). I'm virtually certain the chip was there then. I know we didn't bump it into anything carrying it into the house, and nothing has been bumped into it since then either. In fact, nothing has been bumped into it at any time (that I know of). The source of the chip is a mystery. panel though (not on the side with the silicon). For this reason, I decided to seek "professional help" in assessing it. I don't mind admitting that it makes me nervous. My last marine aquarium was a 55 gallon that the bottom panel burst mysteriously in the night. Actually it wasn't so mysterious because the stand top was not planar and I don't think the tank was completely level either (though it was hard to tell after the fact). THIS stand is planar with one tiny gap (less than 1/32") on one corner. 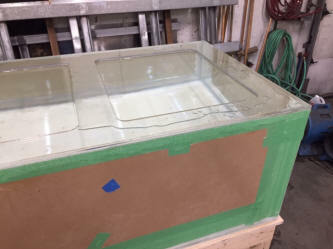 I have used 3/4" Styrofoam underneath the tank to solve that problem. The tank is perfectly level now (with less than three inches of water) and I intend to keep checking it as I fill it--if I get to fill it, which is what I'm hoping that your professional eyes can tell me. I think I know the answer, but is this tank safe to use? Or do I need to save my pennies for another one? I also wanted to share a couple of tips that I learned while leveling the tank. It may be old information to many, but I don't recall reading them anywhere on WWM. I have read about putting a couple of inches of water in the tank and measuring the depth to determine whether it is level. 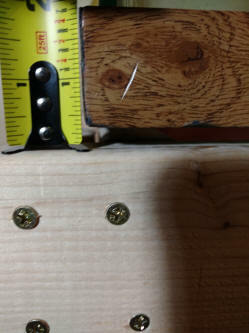 What I discovered is that it is easier to use a yard stick than a tape measure. from the other side. Also I discovered that it helped to draw a rectangle representing the tank from above and write at each corner and in the front and back middle the depth so I could look at all the measurements at the same time and decide where the shims needed to go. Hope someone finds this helpful. As always I thank you SO MUCH for making this service available. I have learned so much over the years from the site and the few email inquiries I have made.